The Goodwill & Cheer Bouquet blooms with joy and seasonal beauty to create the perfect gift for your special recipient. Rich red roses, red carnations, red and white mini carnations, Baby's Breath and a lush assortment of greens are brought together to create a fresh flower arrangement that is both merry and bright. 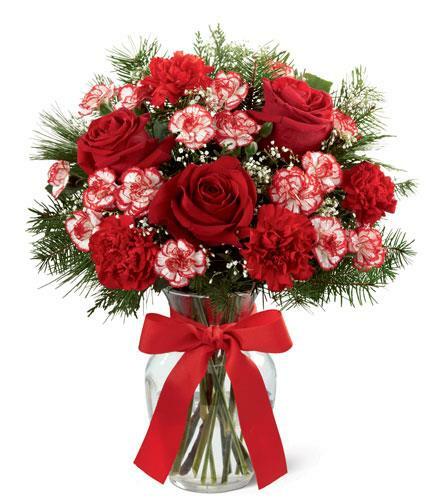 Arranged in a clear glass vase tied with a red ribbon at the neck, this holiday flower bouquet is a spectacular way to spread your goodwill and cheer to friends, family and co-workers throughout the season. Christmas Arrangement - Goodwill & Cheer Vase B12-4958.